Posted on March 26, 2019 by William A. “I have too much storage space,” said no one ever. 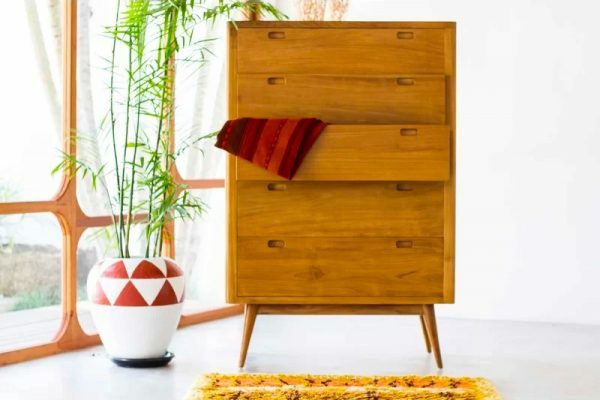 More than just a simple place to store and organize clothing, linens, or knickknacks, a dresser can add mega style to any bedroom—especially if it is of the Mid-Century Modern variety. 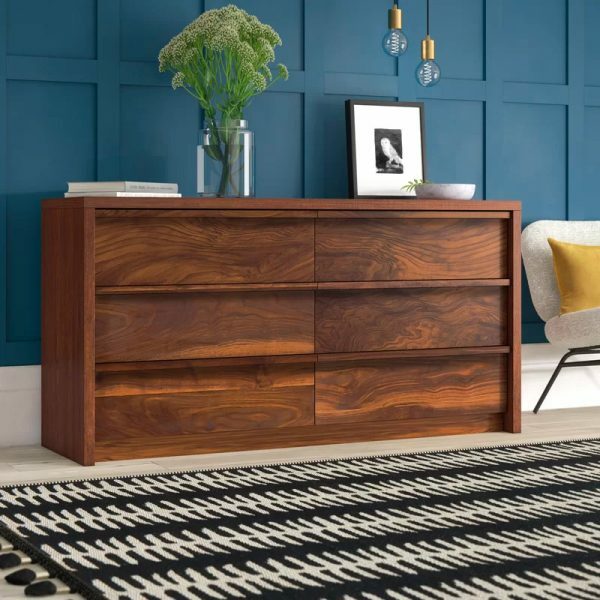 Often made of wood or featuring wood detailing, these sleek dressers are full of warmth and retro charm. 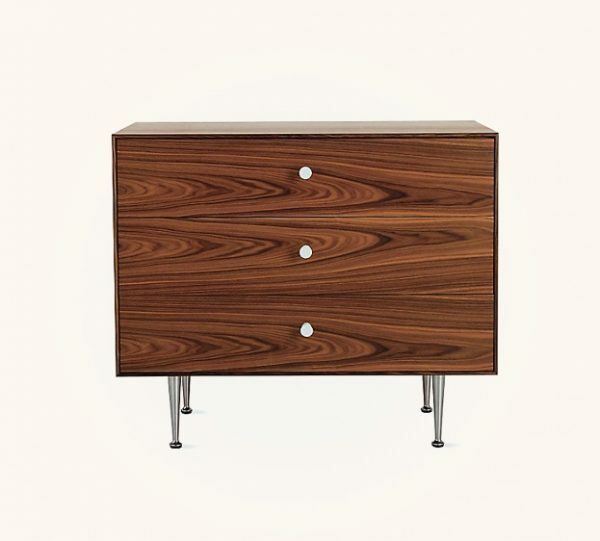 Our list covers the best dressers, with everything from rich brown tall boys with gold accents to large modern dressers with colorful drawers. 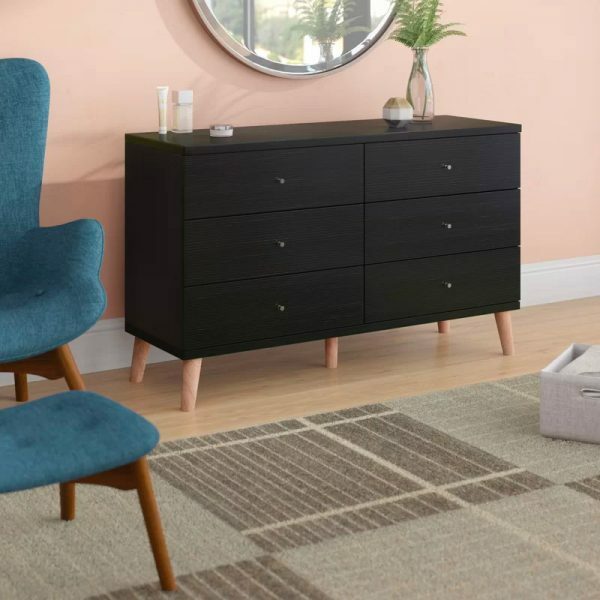 We’ve found the best Mid-Century Modern dressers available, so all you have to do is choose your favorite! Mid Century Modern Style 4 Drawer Dresser: A duo tone dresser with both style and function in mind. 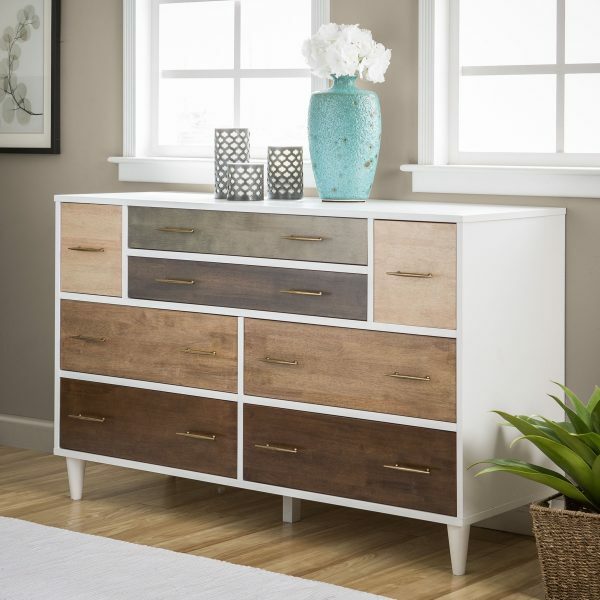 This 4 drawer tallboy features ample storage space, cutout handles, and sleek splayed legs. 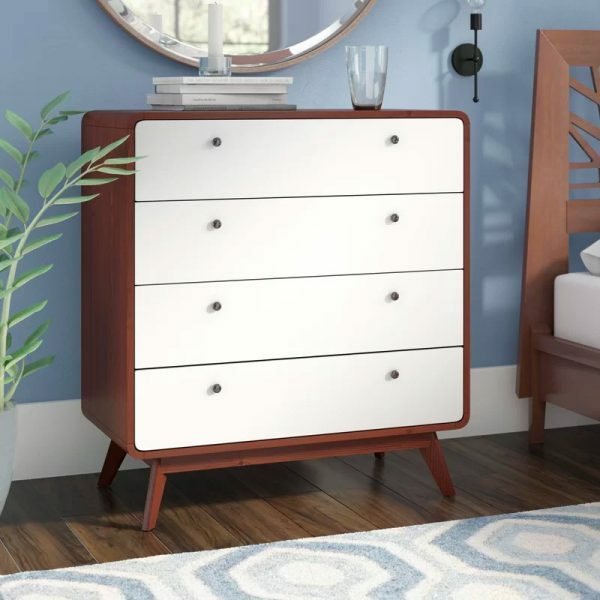 4 Drawer Rounded Rectangle Shape Mid Century Dresser: This mix of cherry wood and white finish makes for a dynamic combo in any Mid-Century Modern bedroom. The rounded edges and round pulls on this dresser give it a soft aesthetic, as well as no sharp corners for kids to crash in to. 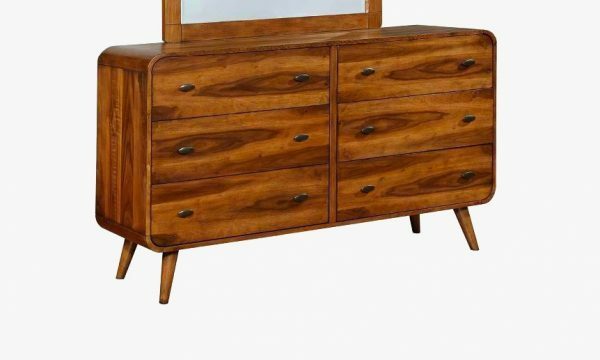 Small Mid Century Modern Dresser: A small Mid-Century Modern dresser with big style. 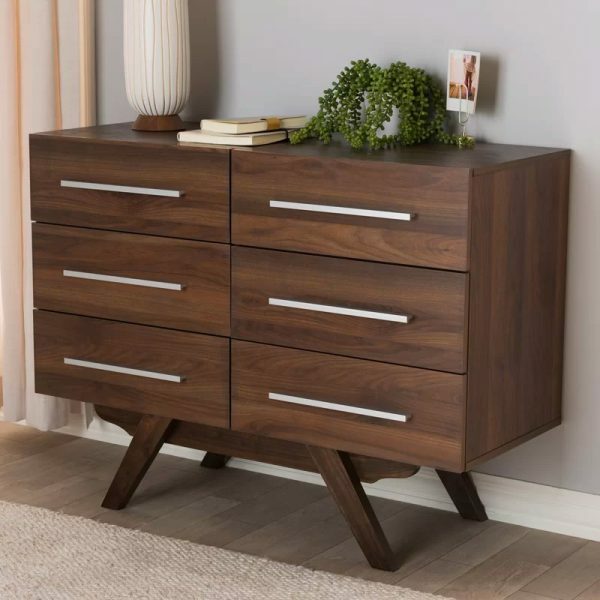 Featuring clean lines, 3 drawers, and an affordable price tag, this little beauty is a great choice for any space that needs both style and storage. Tall Grey & Walnut Mid Century Modern Dresser: The gray and walnut finish on this dresser looks sleek and modern. To give it an extra edge, try using chalk to label the drawers. 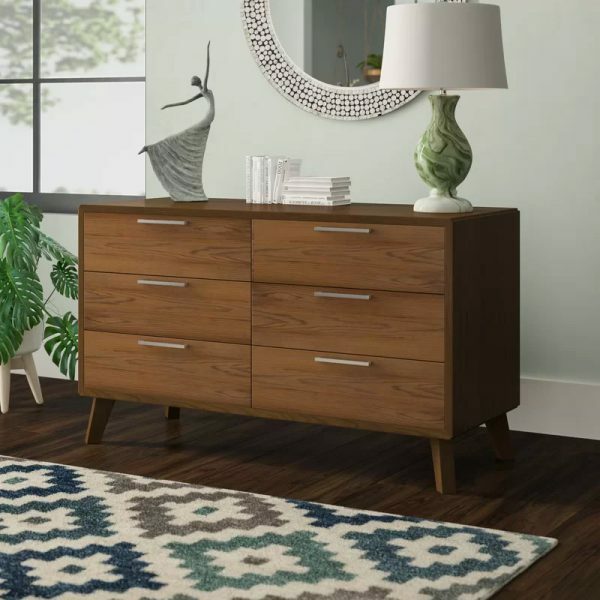 Mid Century Modern Distressed Dresser: This distressed dresser comes with the storage and personality that a Mid-Century Modern space needs. The lightly distressed cherry finish beautifully highlights the clean silhouette, recessed base and slanted legs of this great piece. 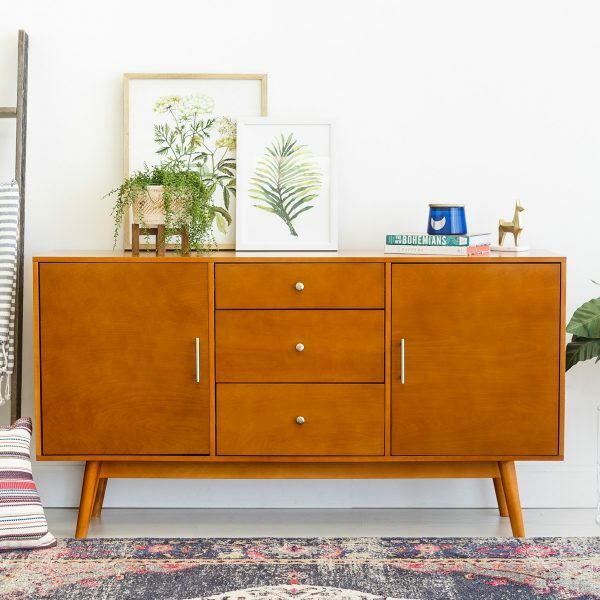 Solid Pinewood Mid Century Modern Dresser: Stylish and built-to-last, it is hard to go wrong with this solid pinewood dresser. The neutral finish matches an array of decor palettes, while the 6 drawer design provides ample storage room. Beautiful Textured Wooden Dresser: A Mid-Century Modern dresser that perfectly highlights the intricacy and texture of its wood. This Danish inspired design is available in Soft White or Grand Walnut (shown). 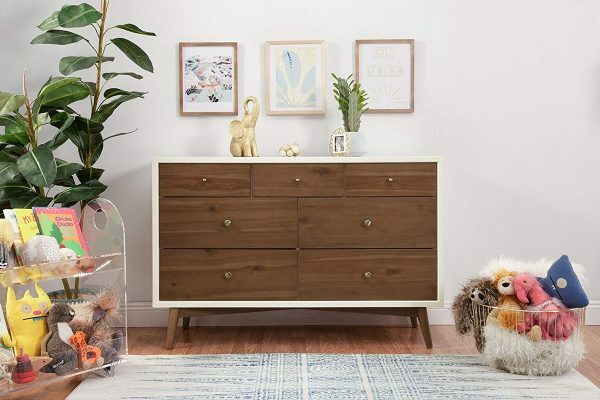 Acorn Finish Mid Century Modern Dresser: An acorn finish dresser that is perfect to squirrel away the odds and ends in your bedroom or living room. It also makes a great TV console with its 3 storage drawers and 2 storage cupboards that boast adjustable shelving. Mid Century Modern Tower Dresser: A tower dresser that is oozing with simplistic, Mid-Century Modern charm. Made with plantation grown teak, this dresser will add the perfect vintage touch to any space. 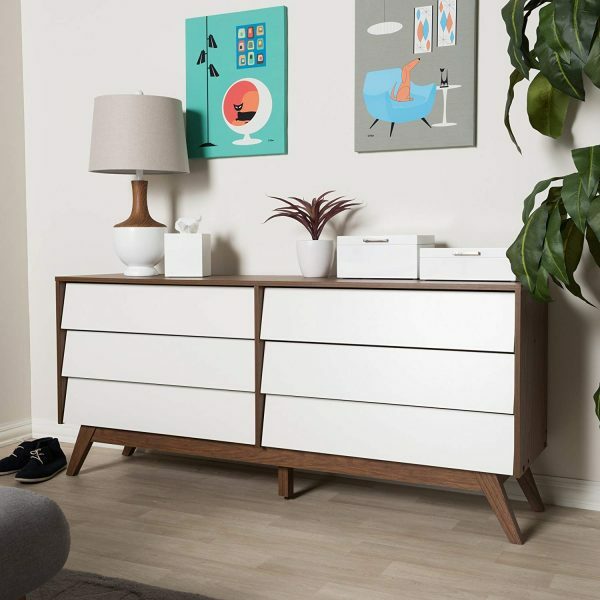 Mid Century Style Console/Dresser With Tapered Legs: Whether used as a small buffet, media cabinet, or compact dresser, no matter where you place this Mid-Century Modern piece, it will look sharp and stylish. Available in White or Acorn (shown). White Dresser With Multi Shade Drawers: Multi shade drawers give this white dresser a dash of unexpected flair. 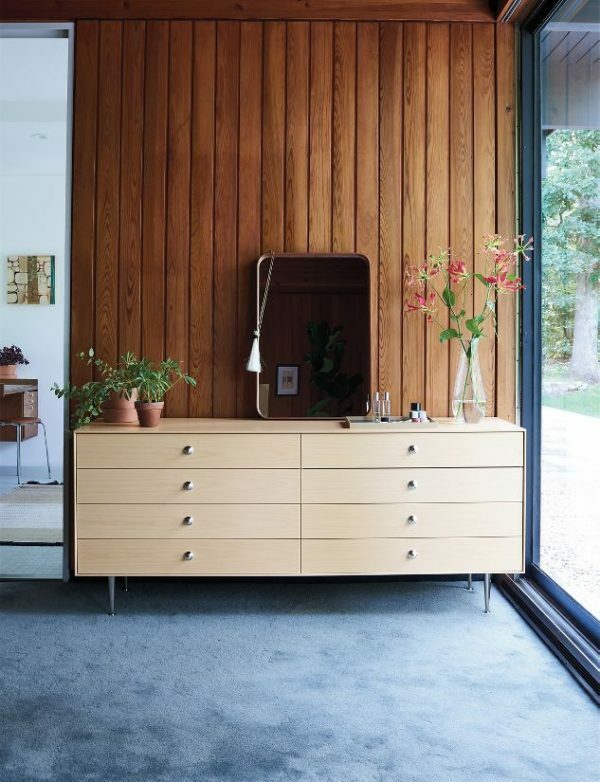 A great Mid-Century Modern dresser for those who like their decor to be slightly offbeat. 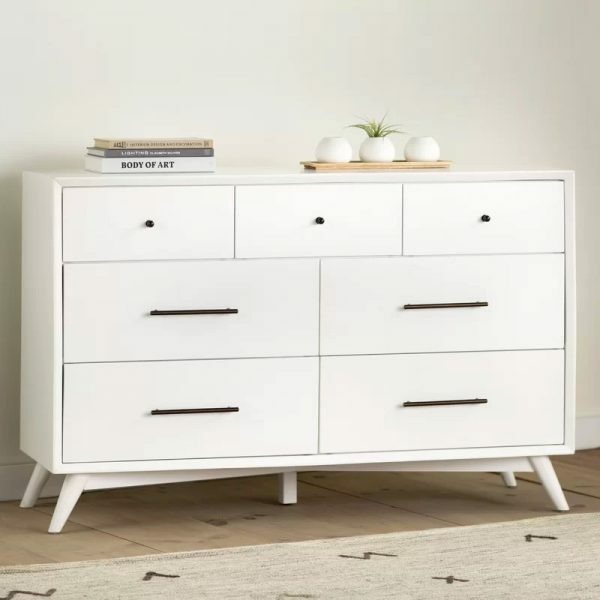 White Mid Century Modern Dresser: A bright white dresser with a clean aesthetic that is highlighted by its contrasting drawer pulls. A piece that will look effortlessly chic whether paired with soothing neutrals or bold textiles. Also available in Acorn. 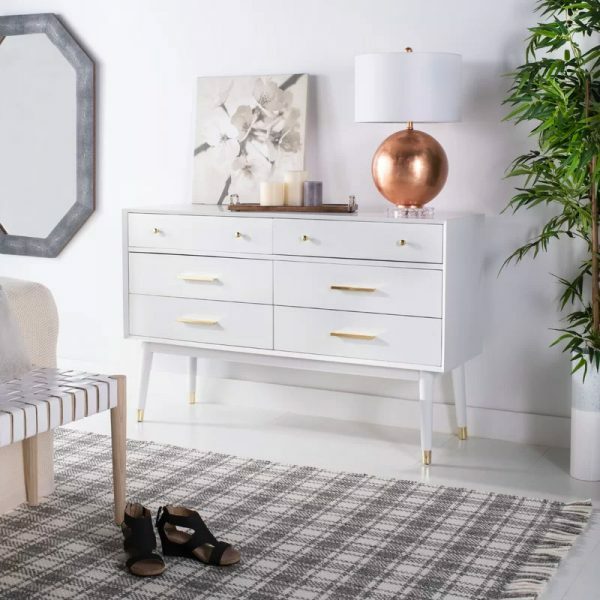 White Mid Century Modern Dresser With Gold Tipped Legs: A white Mid-Century Modern dresser with a touch of luxe gold. A glam color combo on a beautiful build that you and your bedroom don’t want to miss. Also available in Walnut or Black. 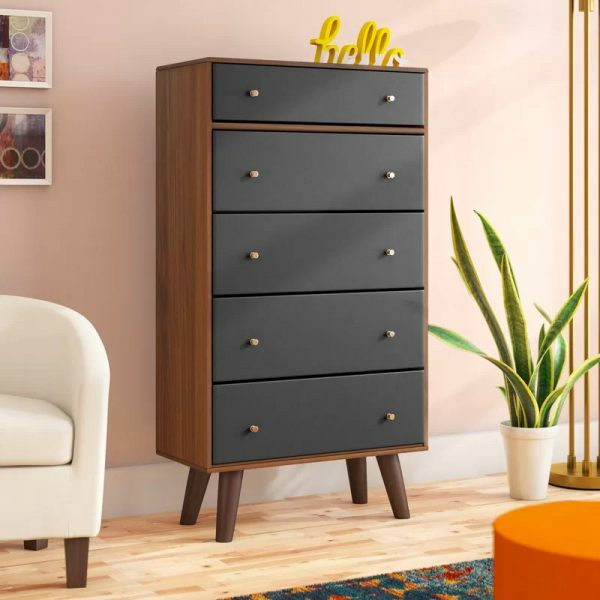 Black Mid Century Modern Dresser: This black beauty is the Mid-Century Modern dresser you need to add a splash of contrast to light and bright rooms. If black isn’t for you though, this sleek design is also available in Distressed Gray or White. Astrid 5 Drawer Chest: This sensational small dresser is ideal for space challenged homes or those who need an extra boost of storage. 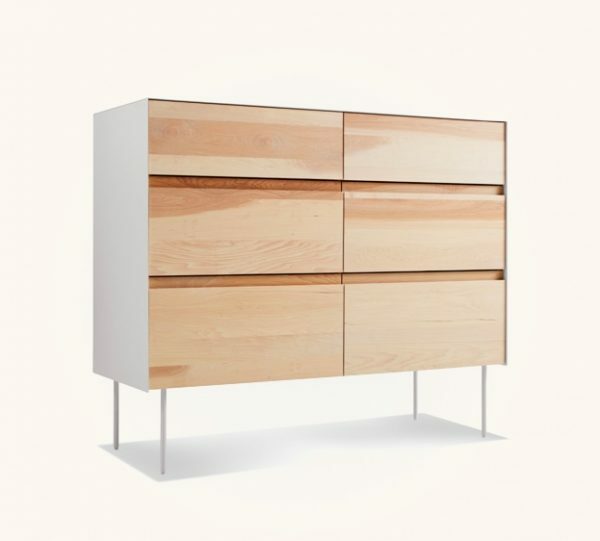 A great eco-friendly dresser by Copeland—a company that believes in sustainable business practices. Available in 12 colors. 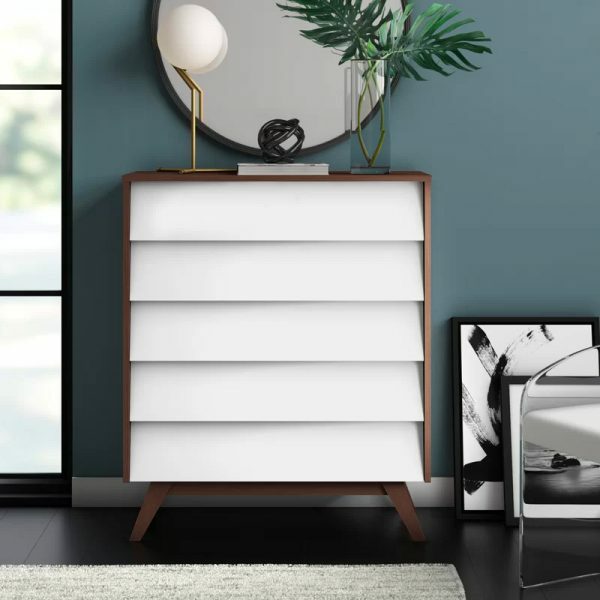 F22 Butler Dresser: If you are looking for a dresser with a dynamic design and coloring, the F22 Butler dresser should definitely go on your short list. 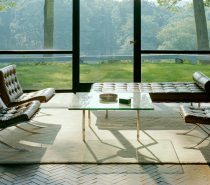 With various styles and colors to choose from, you are sure to find a piece to add fresh and modern elegance to any home. 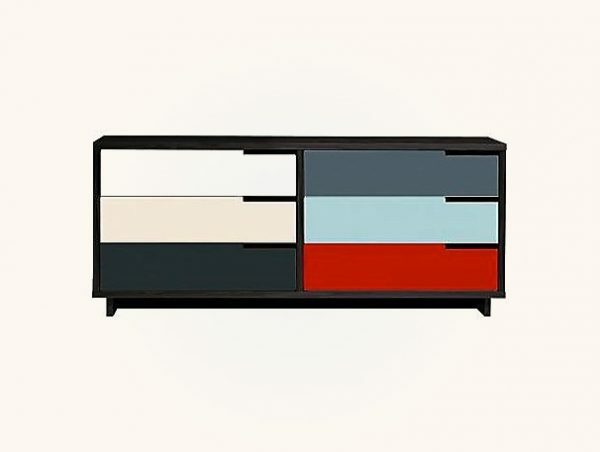 Mid Century Dresser With Colorful Drawers: With an edgy use of color that is both dynamic and unexpected, this dresser is sure to catch a few glances. The frame is available in three different finishes: Maple, Walnut, or Graphite on Oak (shown). 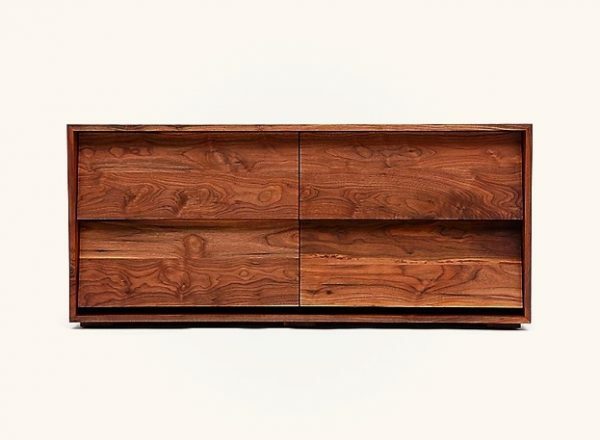 Walnut Display Dresser: The unforgettable design of this walnut display dresser is bold and unique. 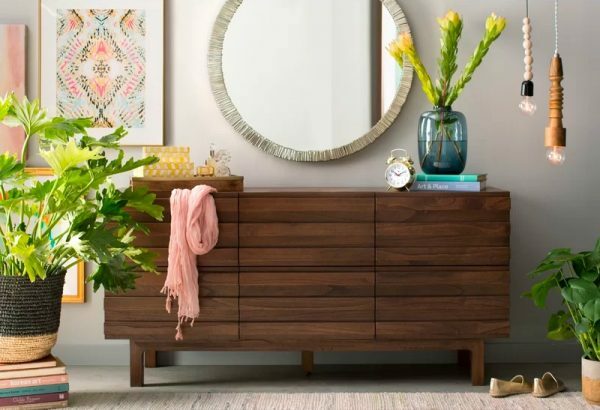 Featuring organic slats and multiple storage shelves, it is an ideal dresser for both those living in tight quarters and decor lovers on a budget. Available in multiple sizes. 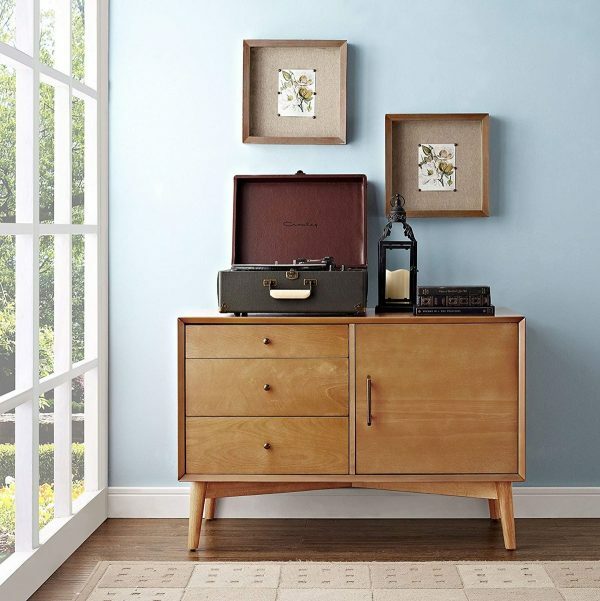 6 Drawer Mid Century Style Dresser: The brown tone of this dresser will help infuse any setup with a bit of warmth. The best part? It is a budget-friendly buy, positioning itself at the cheaper end of our collection. Available in Dark Brown or Walnut (shown). 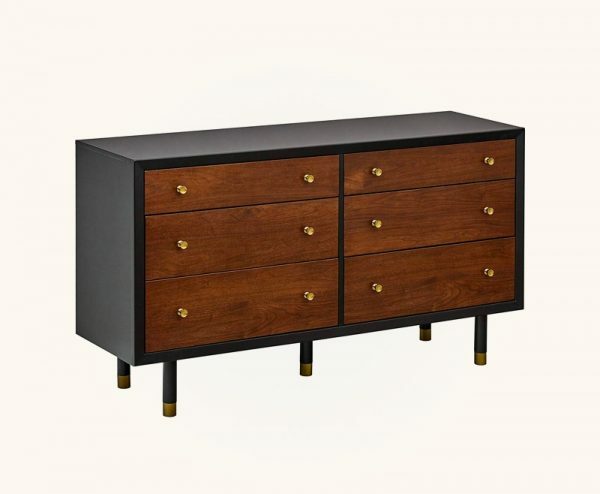 Black And Walnut Dresser With Golden Accents: The deep tones of this dresser paired with its brass knobs and feet have it overflowing with an elegant and luxurious feel. Made from solid hardwood with walnut and birch veneers. A matching end table is also available. 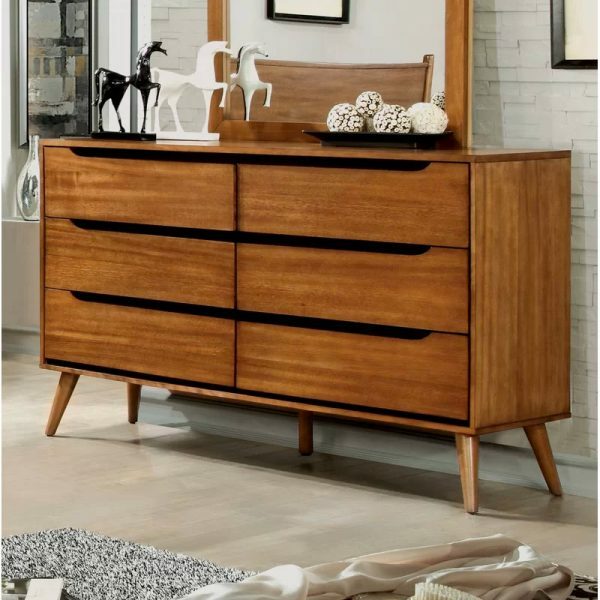 Mid Century Style Dresser With Mirror: The soft edges of this dresser really helps highlight the wood grain shown throughout. 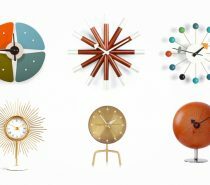 A lovely pick for any Mid-Century Modern bedroom. Mirror included. 4 Drawer Wooden Dresser: A 4 drawer dresser that features ample storage and a simplistic design that will mesh with a variety of decor styles. 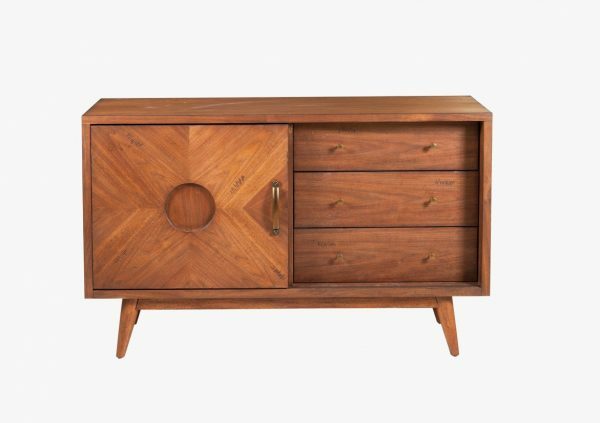 A high-quality Mid-Century Modern furniture piece made from solid Walnut wood. 6-Drawer Storage Dresser: This 6 drawer storage dresser is both easy on the eyes and the wallet. Featuring slanted drawers for tons of storage and a dynamic, two tone finish. Small 5 Drawer Mid Century Style Dresser: Small but mighty, this 5 drawer dresser has tons of character that is sure to attract a lot of attention. A great storage chest that provides you with extra storage space for your lingerie, linens, and/or clothes. 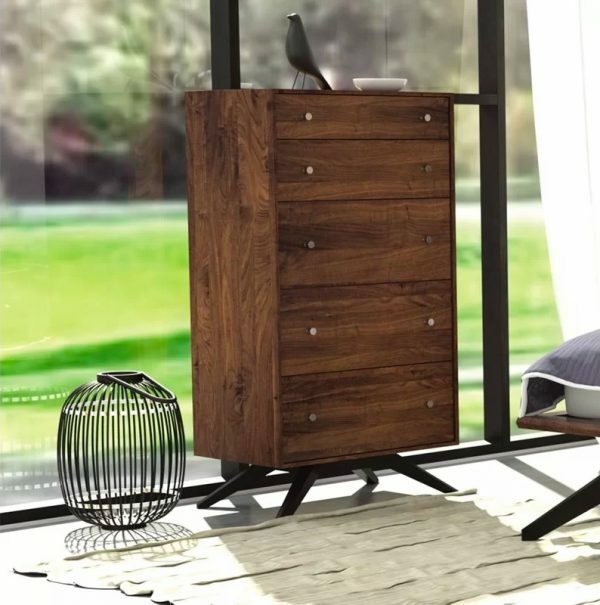 Dark Wooden Modern Dresser: A simple dresser is given an unexpected edge with its front slatted design. A great 6 drawer storage unit with tons of room for clothes, linens, or any odds and ends that need to be stashed away. Patterned Wood Mid Century Modern Dresser With Golden Accents: A dresser worthy of the Midas touch. 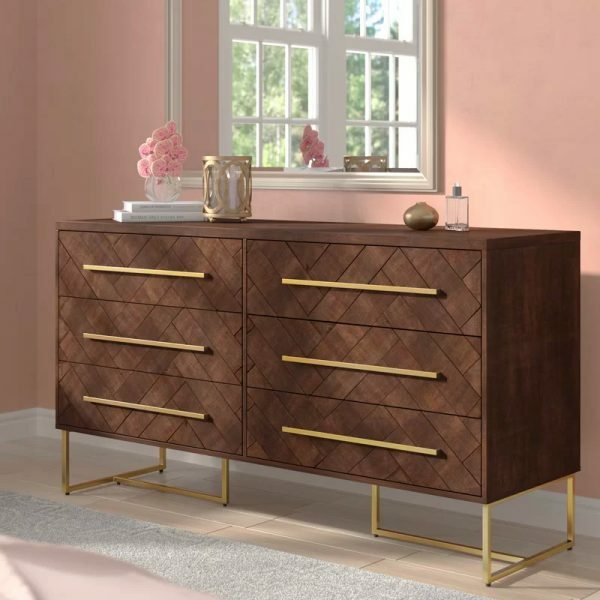 The contrasting gold accents on this rich brown dresser provide just the right amount of flair—without overpowering the herringbone pattern. Available in Stone or Java (shown). 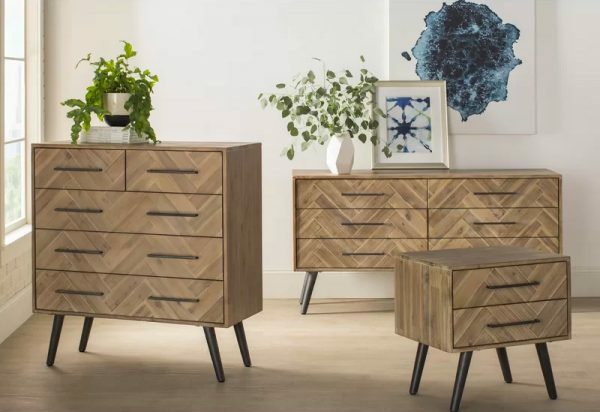 Herringbone Patterned Double Dresser: If you are looking to inject a bit of intrigue in your furniture, these herringbone patterned dressers are just what the design doctor ordered. Available in 2 dresser designs and a nightstand. 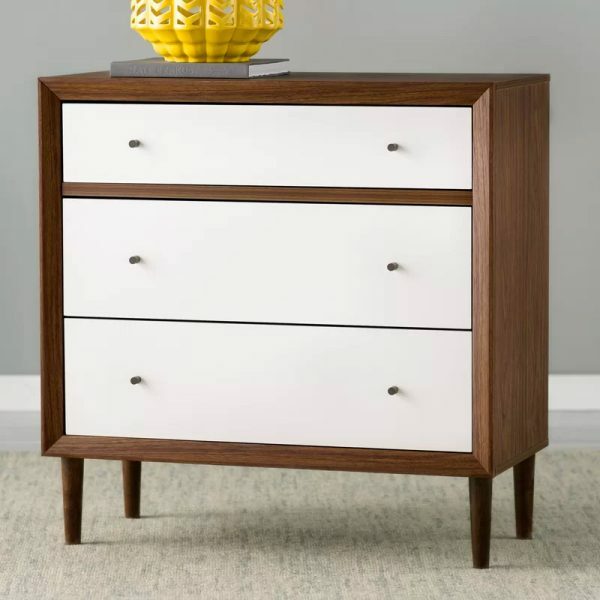 Modern Mid Century Style Dresser With Square Tapered Legs: Square tapered legs and metal pulls are sweet little details that helps this dresser shine. Available in Gray Wash or Walnut Veneer (shown). 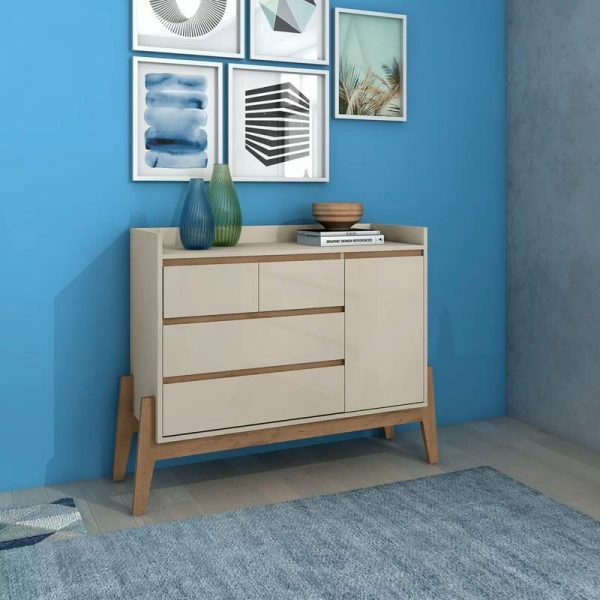 Rectangular Mid Century Style Dresser: Elements of the unexpected can set you interior design apart from the rest, so dressers like this are a must. The pop of blue on the top drawer make this tallboy well-suited for beach homes or rooms that need an infusion of vintage charisma. 4 Drawer Combo Dresser: Perched upon a unique stand, this 4 drawer combo dresser is quite the find. 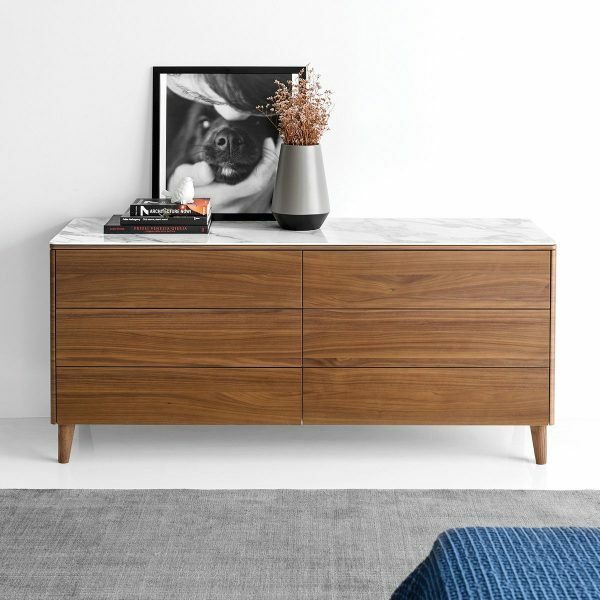 A fantastic neutral storage piece that combines both style and function. Also available in Gray. 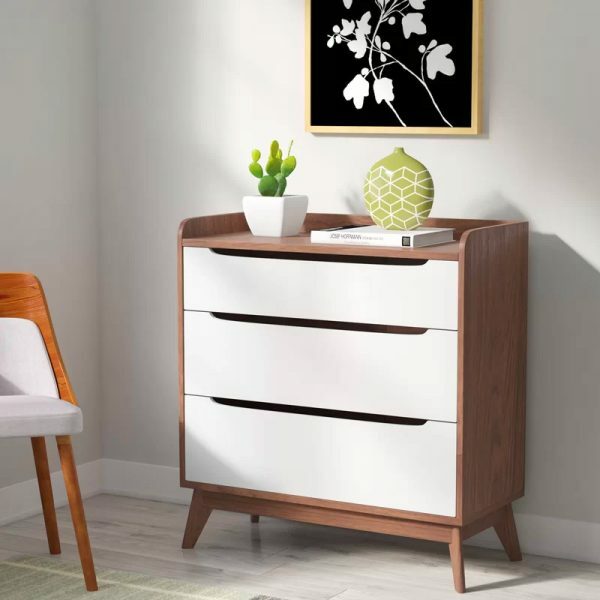 Small Dual Tone Mid Century Modern Style Dresser: A Mid-Century style dresser that is chic enough for the bedroom, yet functional enough for the home office. A piece that will compliment any interior, from Contemporary to Scandinavian. Retro Style 3 Drawer Dresser: If you’re looking for a modern dresser with a retro feel, then this is a definite contender. Made with renewable solid pine that features stunning patterning across its entirety. Also available in Natural Washed. 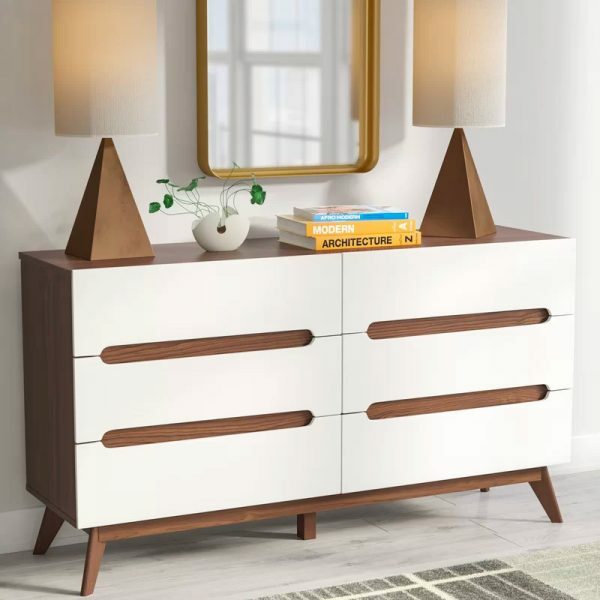 Mid Century Modern White & Walnut Dresser With X-Frame: A stylish and sophisticated Mid-Century Modern dresser with an X-frame, flared tapered legs, and sleek brushed metal hardware. Arrives fully assembled. Mid Century Modern Double Dresser: This double dresser looks extra chic thanks to its two tone design and cutout drawer pulls. A must have for any bedroom or entryway that needs both style and storage. 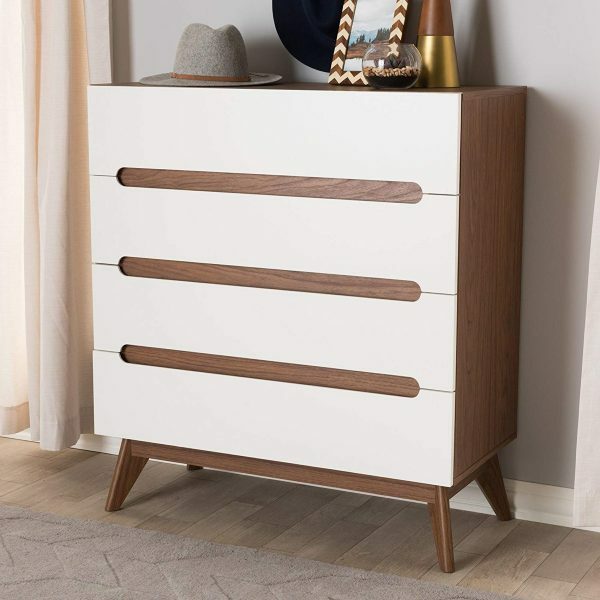 Modern White And Wooden Dresser: The white, flat front of this dresser gives it a clean and fresh feel that any room can benefit from. 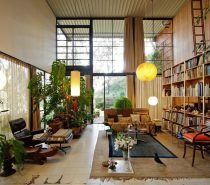 A fantastic piece if you are going for a minimalist look. Wood & Steel Dresser: We couldn’t resist the dynamic look of this dresser that mixes the warmth of wood and the cool of steel. Available in Hickory/Oyster, Walnut/Oblivion, or Hickory/White (shown). 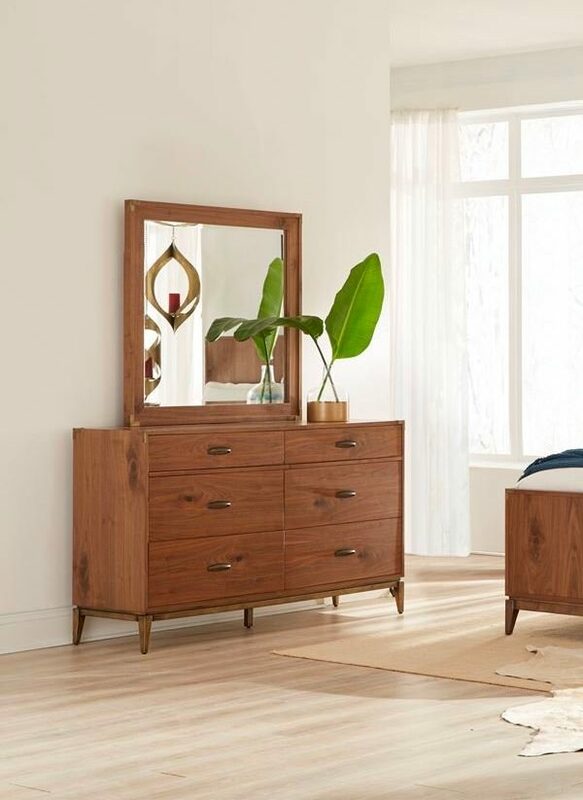 Mid Century Dresser With Mirror: Mirror, mirror on the wall, which is the best dresser of them all? 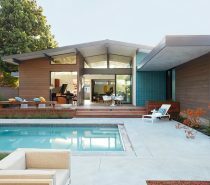 This Mid-Century Modern beauty with its built-in mirror definitely hovers near the top of our picks. 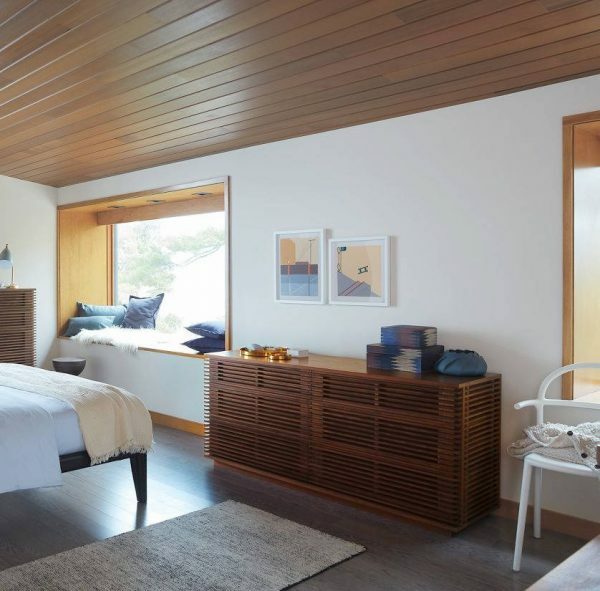 A simple, yet sophisticated, dresser that will take any bedroom’s decor up a notch. 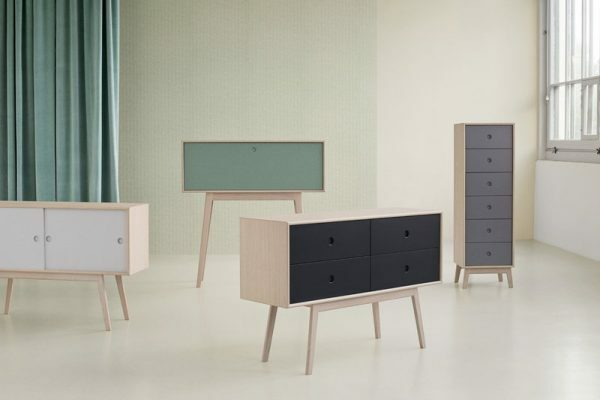 Line Wide Dresser: If you love offbeat style that doesn’t inhibit function, then the Line Wide Dresser is for you. Available with a matching bedside table or tall dresser in Oak or Walnut (shown). 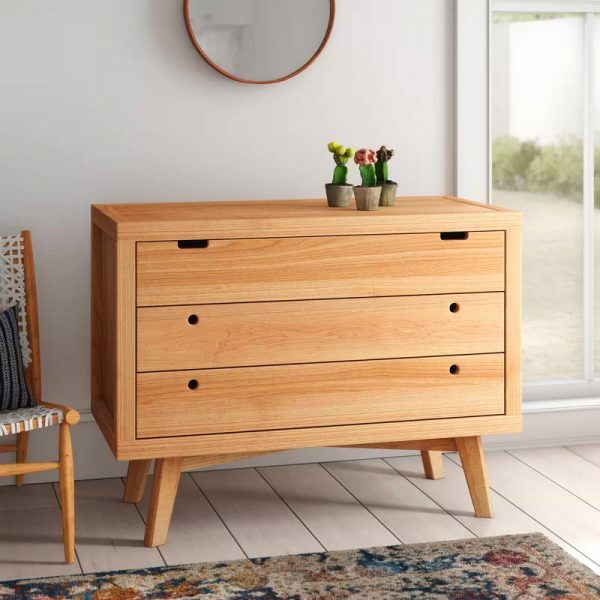 Beautiful Wood Veneer Dresser: For when you need an extra boost of storage, small dressers like this Nelson classic from the Thin Edge collection can be indispensable. 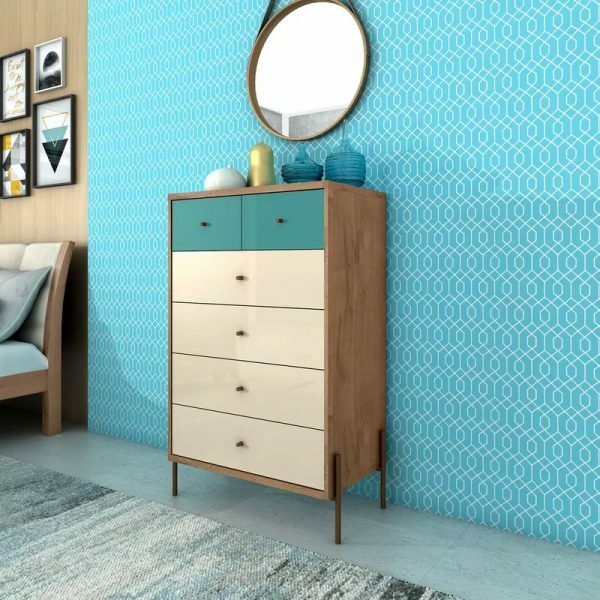 This dresser may be full of Mid-Century Modern style, but it has a simple look that will mesh well with most types of decor. 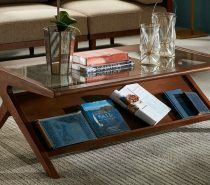 Available in Walnut, Ash, or Palisander (shown). 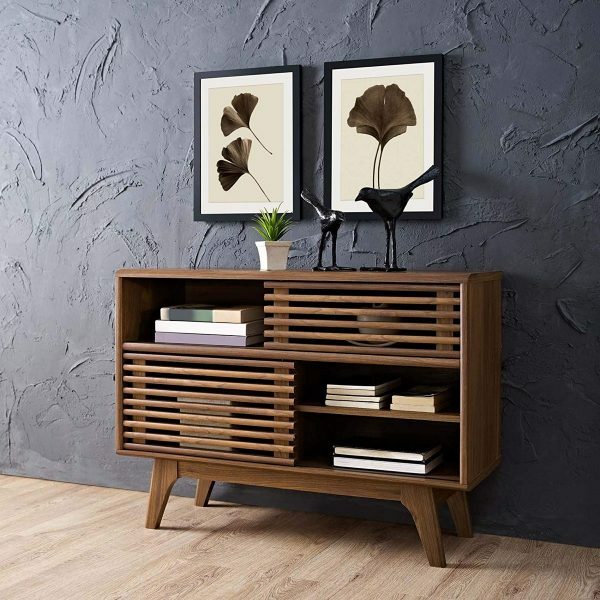 Nelson Thin Edge Double Dresser: With an array of iconic Mid-Century Modern designs under Nelson’s belt, it is no wonder that this dresser is oozing with effortless style. 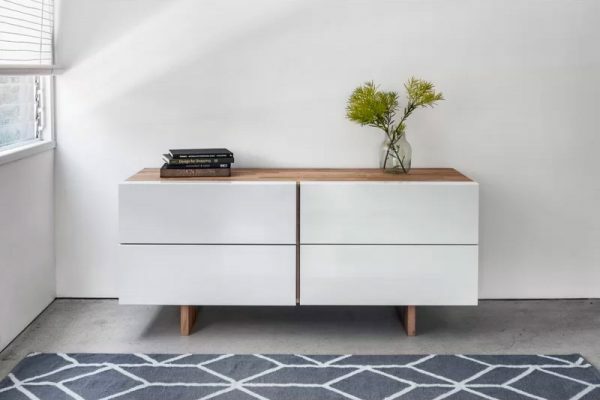 Manufactured today with environmentally sustainable veneers and 85% recycled materials, the Thin Edge dresser uses the latest manufacturing technologies, all without compromising the original look and feel. 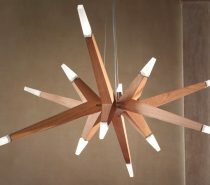 Available in Palisander, Walnut, or Ash (shown). Mid Century Modern Dresser With Ceramic Top: Nothing exudes elegance quite like the look of marble and this ceramic top dresser knows it. This flush front, wood dresser is a unique choice that is available in 4 base colors and 5 top colors.